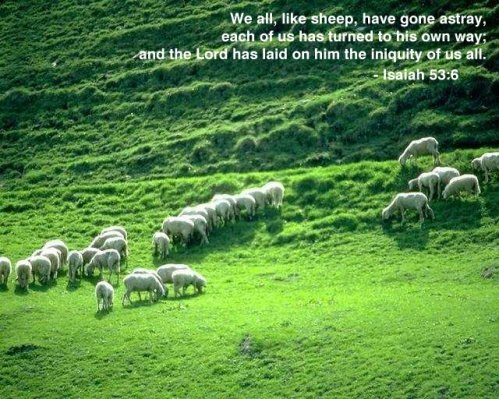 Old Testament - Isaiah chapter 53 is one of the most powerful chapters of the Bible - and one of the saddest to really meditate upon. Isaiah chapter 53 is all about Jesus! This is a powerful chapter to read... I'm sure you likely caught that this chapter was about Jesus when you first read it, but if not, please re-read the chapter again and do you see how Isaiah is prophesying Jesus' passion and death? It is astounding to realize these words of Isaiah's were written in 8th century B.C. Verse 5 tells us: "But he was wounded and crushed for our sins. 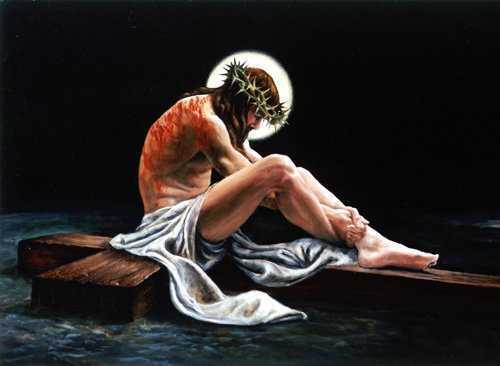 He was beaten that we might have peace. He was whipped, and we were healed!" Do you believe that the words of Isaiah's in chapter 53 today are about Jesus? 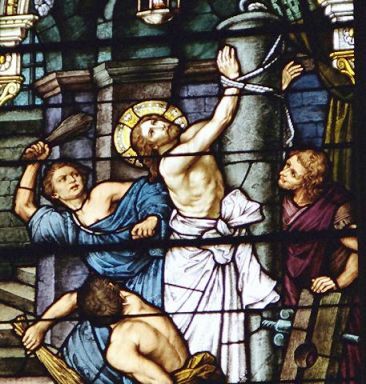 Do you believe that Jesus was wounded and crushed for your sins? Was he beaten that you might have peace? Are you healed because Jesus was whipped and then murdered on a cross? Verse 7: "He was oppressed and treated harshly, yet he never said a word. He was led as a lamb to the slaughter. And as a sheep is silent before the shearers, he did not open his mouth." Verse 8: "From prison and trial they led him away to his death. 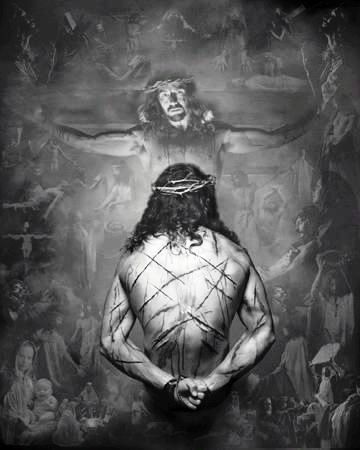 But who among the people realized that he was dying for their sins--that he was suffering their punishment?" 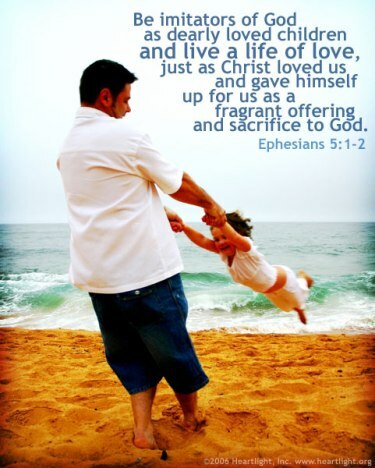 Ephesians 5:1-2 touches on a theme I've been thinking a lot about lately - living a life of love! - "Be imitators of God, therefore, as dearly loved children and live a life of love, just as Christ loved us and gave himself up for us as a fragrant offering and sacrifice to God." (NIV) Have you ever meditated on what it means to live a life of love? I have occasionally. But I'm starting to camp out on this thought a lot more these days. I think it's in large part due to the impact 1 Corinthians 13 has had on me this past year. And it certainly fits in well with Jesus saying the 2 most important commandments are to love God and love people. But perhaps most significantly, I've been trying to live out this thought of "living a life of love" in real life a bit more these days. I definitely don't have it all figured out by a long shot! But I think living a life of love is something we should all seek. Not strive for. But seek. Or maybe "receive" is the better word. I think we can receive from Jesus the ability to live a life of love. I don't think we can get there on our own power. So, there's a lot more I could write about what I've been thinking about in regards to living a life of love. But let me at this point just encourage you to think about this concept. Living a life of love. Do you want to live a life of love? Think you can do this on your own? Or will you invite Jesus and the Holy Spirit into this process each and every day? 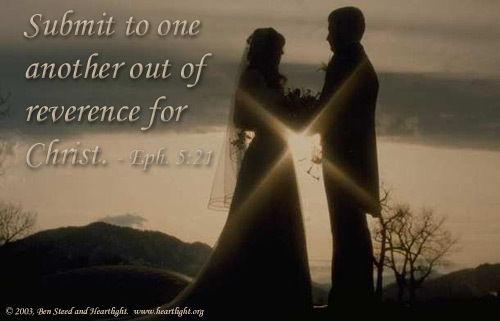 How does 1 Corinthians 13 speak to you these days? Ephesians chapter 5 verse 17 really stood out to me today: "Don't act thoughtlessly, but try to understand what the Lord wants you to do." I am wondering how often each of acts thoughtlessly? I am afraid in my case it is far too often. I can sometimes sleep-walk through my day - or even days - or even weeks... and miss the point of life completely when doing so! 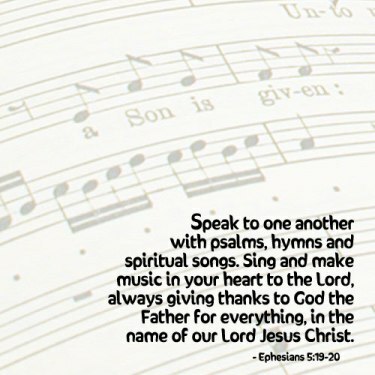 Paul teaches us here to try to understand what the Lord wants us to do. Why would we want to try to understand this? I think in large part so we no longer act thoughtlessly! I'm afraid we are far too often a thoughtless people in how we live our lives & how we waste so much time in our very short lives this side of heaven... How about you? Are you acting thoughtlessly at all these days? Will you seek to understand what God wants you to do? And then will you go do it and leave your thoughtless ways behind? 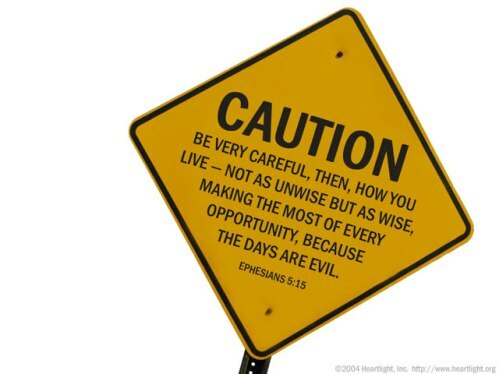 Proverbs - Proverbs 24 verse 7 is actually a bit convicting for me - "Wisdom is too much for a fool." I'm not sure if you've ever experienced this, but there have been times when I honestly have not been able to read or digest the Bible. I mean, there are times when I can kind of work my way through reading the Bible, but nothing is sticking. And obviously the Bible is wisdom... I then wonder if at times I am a fool? I don't think I'm a chronic fool... :) But, truly, sometimes I do dumb stuff or live in a dumb season and in retrospect I was acting like a fool in those seasons. And in those foolish seasons wisdom was too much for me... I do ultimately think Jesus / God / the Bible / wisdom brought me out of those foolish seasons. But let us pray that we don't enter into seasons of life where we are acting like a fool, and where wisdom is too much for us. Being a fool is no way to live this beautiful life God has called us to! By His wounds, have you been healed? Click here to be healed! Prayer Point: Pray that there is not even a hint of sexual immorality in your life today. Pray that there is not even a hint of any kind of impurity nor of greed in your life today. Pray that you are living as one of God's holy people, through your saving faith in Jesus Christ as your Lord and Savior. The verses that have spoken to me today are in the 51st chapter, “WOW”! God in verses 7 and 8 is still giving us the information to intelligently decide between choosing life or death; blessings or curses. This was the option given to the people by Moses (Deut. 30:19 & Joshua 24:15-22). For the moth shall eat them up like a garment, and the worm shall eat them like wool: but my righteousness shall be forever, and my salvation from generation to generation. Choose righteousness and not the righteousness of self-righteousness that comes with doing the works of the flesh, but the Righteousness that comes from God, God’s Right Way of Doing and Being. Mike your question regarding the New Testament reading, >>”Don't act thoughtlessly, but try to understand what the Lord wants you to do." I am wondering how often each of acts thoughtlessly?>> and, >> "For the LORD hears the cries of his needy ones; he does not despise his people who are oppressed." God hears the cries of his needy ones. 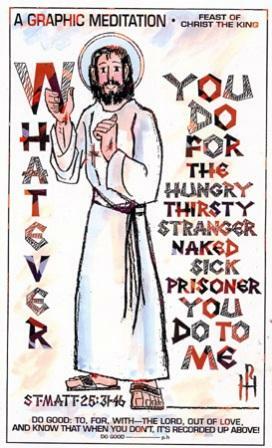 Perhaps the question is then, do we hear the cries of God's needy ones?>> are both one and the same in action. If we are not acting thoughtlessly and getting our instruction from God, then we will hear the cry of the needy. Where we error is in thinking that because God is leading us to do something specific with a group of people that means God is leading everyone else to do that same thing and we get caught up in trying, through guilt and any other means of manipulation, to bring everyone else along. We forget that the Body of Christ is like our own body, as per Paul; each one has a purpose and a call and when we work as one part of the many and do what we have been called and purposed to do, even if it is not what the most vocal and persuasive of person is doing, than the job will get done. In fact, there would be no need to put a call out for help because the job would be done by everyone sticking to their purpose and call.